Radishes and brussels sprouts add extra color and flavor, and everything is quickly chopped up in the food processor. It even goes well with champagne, though of course I think pretty much everything goes well with champagne. And then there are these Easy Chocolate Babycakes with Mocha (or Chocolate) Buttercream Frosting, which definitely go well with champagne (and milk). They're made with the batter for my simple Emergency Chocolate Loaf Cake, which I've been making for about 14 years, and are really cute and really tasty. And I could just leave it at that, but I'm going to share some recently acquired chocolate cupcake wisdom with you instead. During the last three days I've mixed up at least six test batches of this batter, including one accidentally made with 1/4 cup (!) of cinnamon instead of cocoa (don't ask, but if you like cinnamon red hots, you might want to try it). All I wanted to do was see how many standard size cupcakes it made, and maybe snap a few new photos. It ended up being one of those runaway, totally unplanned, somewhat nervewracking, calorie-laden experiments I just couldn't tear myself away from, despite announcing several times, "That's it! I'm not making any more cupcakes!" and as evidenced by yet another batch of cupcakes baked this morning. My final conclusions after all this chocolate hoopla? —For some reason, mini cupcakes made with this batter bake up better than regular size cupcakes. —Baking two large cupcake pans on the same oven rack is not a good idea. —Cramming all the batter into one 12-cup cupcake pan (because you don't want to use two pans on the same rack and never bake stuff on two racks at once) is not a good idea. —Little square baby cakes made in the above mentioned dessert bar pan are not only adorable (sorry, no photos), but they also give you a higher frosting to cake ratio per bite, which is important information for some of us. —The flavor and color of the cupcakes are altered in a very strange way when you decrease the baking soda from 1 teaspoon to 1/2 teaspoon (in an attempt to keep the 9"x5" loaf version from sinking in the middle like it sometimes does). Fortunately the sinking doesn't affect the flavor. 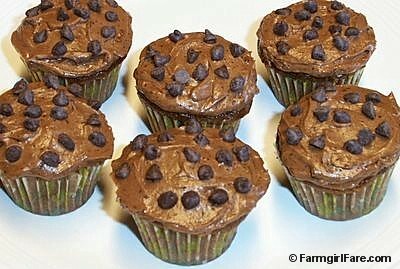 —It may not actually be possible to put too much chocolate or mocha buttercream frosting on a cupcake, no matter what size or shape. —Even the ugly, unfrosted cupcakes are hard to stop eating. There are now printer-friendly versions included for both the Emergency Chocolate Loaf Cake and Easy Chocolate Babycakes with Mocha Buttercream Frosting. Enjoy! © FarmgirlFare.com, the slightly obsessed with recipe testing foodie farm blog where last week, in an attempt at better organizing and scheduling my life, I decided I would only do computer blogging work on certain days of the week, rather than the usual seven. So far I'm failing miserably—but at least we're well prepared for the next several dozen chocolate cake emergencies. The slaw looks yummy and your cupcake "adventure" had me in stitches! LOL!! I've never really wished I lived in Missouri. Until now. I would so happily help you dispose of all those cupcakes. Except the cinnamon ones.